What would happen to us if Greece defaulted? 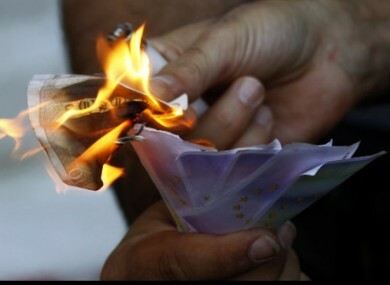 A protestor uses a burning €10 note to set fire to fake banknotes during an anti-austerity protest outside Greece's central bank in Athens today. IT’S GETTING (MORE) SERIOUS in Greece. The Prime Minister George Papandreou has just called off a visit to the US, with the Associated Press reporting that he said his priority is to steer his country through this “critical” coming week. The rush? To meet the financial adjustments required by the EU and IMF so that they release the next batch of loans to stop Greece descending into default on its debts. TheJournal.ie has asked a raft of experts for their opinion on what would happen should Greece not make the grade in seven days’ time. Our entire banking system is in effect dead domestically and we are reliant on ECB to provide liquidity and to provide cash into the cash machines. That ‘blood transfusion’ from the ECB will be severely threatened if the rest of Europe goes to the ECB for funds as well. Mortgage interest rates will rise as will the rates paid on personal loans, not just on new loans but on existing ones. In terms of by how much it is difficult to quantify. Gurdgiev believes we are in “unchartered waters” given this has never happened before, making it difficult to predict what action the ECB will take if Greece defaults. In the long term, the banking system globally will be affected badly meaning there is less capital, less money to lend and when it is lent, at a much higher interest rate. For Ireland, this will have all sorts of effects in terms of businesses being able to access finance to innovate and create jobs which impacts on employment figures and long term GDP growth. The end of the euro? The collapse of the EU? These are just some of the extreme outcomes being predicted if the worst happens and Greece defaults. But are these valid concerns, or an example of a high degree of political brinkmanship? Professor Daniel Thomas, Director of the Dublin European Institute at UCD says that claims that the very existence of the EU is under threat are overblown. He says that the EU is facing its biggest crisis since it was founded. The sovereign debt crisis has revealed major flaws in the design of the single currency and in the general economic governance of the EU. However, Professor Thomas said that in the unlikely event that the euro is destroyed, the EU itself is too advantageous for the member states for them to abandon it. Professor Alun Jones, an expert in political geography at UCD, says that he’d be surprised if Greece is allowed to default as the contagion effect to other peripheral economies would be too intense, and the high exposure of French banks to Greek debt would have serious ramifications. He feels that the current crisis is an extreme example of political brinkmanship, with the power players seeing how far they can push the situation in order to secure a better outcome. Jones also said that the push for a fiscal union in Europe will intensify, particularly as governments not in the euro, eg the UK, call for decisive action by euro states. This week the British chancellor George Osbourne said that officials from Europe’s major economies are demanding a new treaty to strengthen fiscal integration. That’s the moment when people start asking on Liveline about whether money is safe in the banks. Then you have a panic. There will be a rush to save capital, people’s savings and pensions, and there’ll be people cashing out of the euro and exchanging euros for pounds or dollars. Then in terms of wider psychological effects in the medium term, it’s all about uncertainty. You have to look at whether uncertainty is increasing or decreasing. And unfortunately at the moment it’s increasing. People are risk-averse, and further turbulence will exacerbate that – meaning more saving, more reluctance to borrow money, more reluctance to make big commitments like mortgages and marriages. A Greek default would just add to a struggling retail sector’s woes and industry experts say it will not be high on their long list of concerns. After 42 months of sales declines and long periods of inclement weather, Irish retailers are not sure if things can get much worse – default or no default. “Worrying about a Greek default is not our highest priority,” Clerys’ CEO PJ Timmons tells TheJournal.ie. David Fitzsimons, head of Retail Excellence Ireland - a group that represents 650 retailers and 8,500 stores – agrees. “I honestly don’t know if things can get much worse and we are more worried about other things (other than a Greek default) coming down the line,” he says. If any default by Greece spreads to other countries, then we could be in trouble but for the moment Ireland is on track. We hope we have hit the bottom and there will be no more ‘slash and burning’. We just want to get on with retailing – even if we are bouncing along the bottom for a while. At least the comparables are weaker. We hope retailers will have a better December this year than in 2010. There will also be more temporary jobs created this year ahead of Christmas shopping time and January sales. Although I do not think it will happen, a Greek default could trigger the EU into proper action. It could prompt European leaders to give the ECB the tools it needs to properly oversee the banking system – giving people confidence that their deposits are safe. Instead of sticking a plaster over the cut, an operation may be carried out. Ultimately, such a situation could be a good thing. But, overall, Greece is just part of a much bigger story for us. Economist Ronan Lyons explains that there are two main channels to consider if Greece were to default: firstly, how the situation would effect the confidence of businesses and households, and secondly, how it could impact the financial system. “Ideally, the Irish banks would be going to the international capital markets and, ideally, taking out 30-year loans on bond markets to pass on to the customer,” he says. “But, in the case of Greece defaulting, you would be talking about Ireland maybe spending two years off the international markets – making it very difficult for the man on the street to get a mortgage”. Lyons says that a Greek default would have implications for the Irish property prices, although it was almost impossible to predict the level of the impact. It is very difficult to say because, currently, there’s no liquidity in the property market – so there’s no knowledge of the house price level in any meaningful way. We know asking prices… and we have some information from the few fire-sales that we’ve had, but that’s it. One thing is for sure, though, house prices are not going to begin an upwards trajectory soon: “Price houses have already fallen 50 per cent and they won’t stop falling over the next 12 months,” Lyons says. - Reporting by Jen Wade, Hugh O’Connell, Emer McLysaght, Michael Freeman and Sinead O’Carroll. Email “What would happen to us if Greece defaulted?”. Feedback on “What would happen to us if Greece defaulted?”.